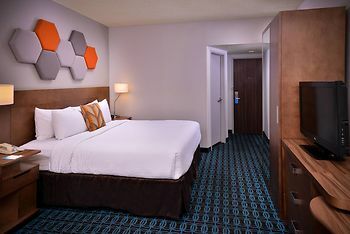 Hotel Fairfield Inn Las Vegas Convention Center, Las Vegas, United States of America - Lowest Rate Guaranteed! With a stay at Fairfield Inn Las Vegas Convention Center in Las Vegas, you'll be within a 5-minute drive of Las Vegas Convention Center and Sands Expo Convention Center. This hotel is 1.2 mi (1.9 km) from Fashion Show Mall and 1.3 mi (2.1 km) from High Roller. The rooms were clean and the staff was nice. We were going to a concert at the Joint and it was within walking distance. If you want to go downtown they have a shuffle that will drop off at the strip. I loved the rooms,its hard to find a hotel that has comfy beds and pillows. The breakfast that they have is also nice and better than some other places Ive been. The location isnt the best. Logos, brands, and other trademarks featured within this site are the property of their respective trademark holders. These trademark holders are not directly affiliated with Hotelsone. Fairfield Inn is a registered trademark.© 2001 - 2019 HotelsOne. All rights reserved.